Deal 7 damage to a creature. Draw a card. Spirit Knife is a common Intelligence action card. It is part of the Houses of Morrowind expansion. 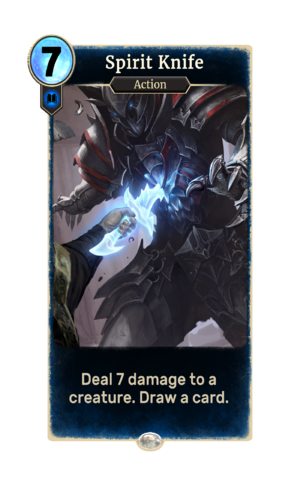 In addition to the card's availability in the Houses of Morrowind expansion, two copies are included in the Telvanni Ambition theme deck. Spirit Knife was a Damage Health spell in Morrowind. This page was last modified on 23 November 2018, at 06:33.